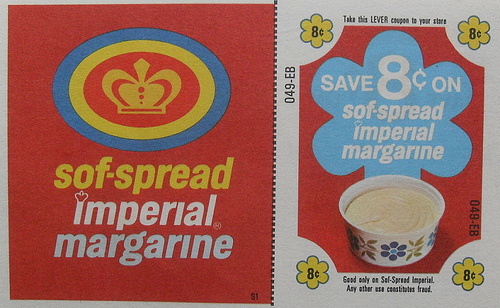 What the hell ever happened to margarine? 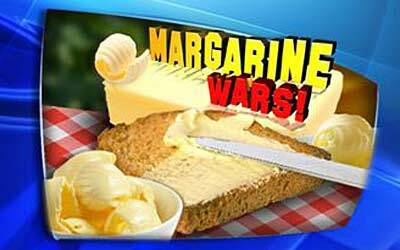 In 2013, 200 years after the French chemist Michel Eugène Chevreul discovered margaric acid (the vital building block in making the original version of margarine), it’s pretty safe to say (in the manner of the final pronouncement on Iron Chef), in America at least, “The Margarine Battle is OVAH!” Go to the store; try finding something labeled as margarine. Seriously. It just ain’t there. 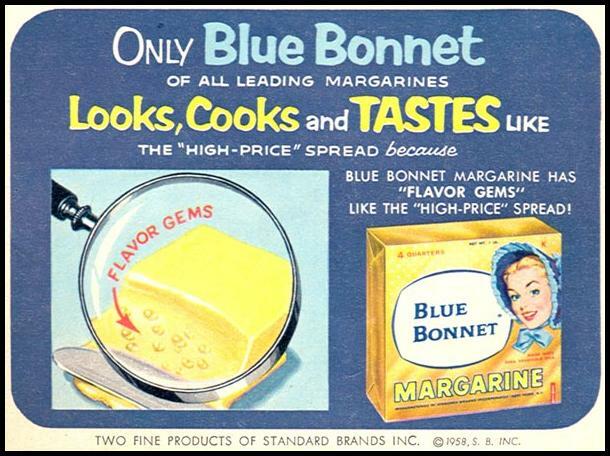 Sure, there are old favourites, such as Parkay and Blue Bonnet and Imperial, all of which used to call themselves margarine, but the word itself is as welcome on their packaging these days as ants at a picnic. Originally produced in 1869, when another French chemist, Hippolyte Mège-Mouriès, rose to a challenge posed by Emperor Napoleon III to make a butter substitute for the armed forces, the new foodstuff was originally called oleomargarine, later shortened to the trade name “margarine.” Mège-Mouriès tried to make a go of producing it commercially, but it failed, and he sold off the patent to the Dutch company Jurgens (not to be confused with the American company founded by Andrew Jergens of Jergens Lotion fame, though both made soap). In 1930, the company merged with Lever Brothers to form Unilever, which continues to make margarine — much of it not billed as such (including Promise, I can’t believe it’s not Butter!, and Country Crock) — even today. 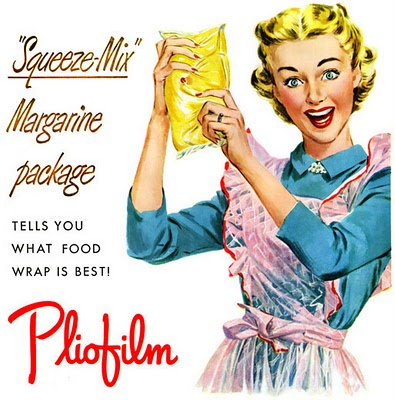 (d) Each part of the contents of the package is contained in a wrapper or separate container which bears the word “oleomargarine” or “margarine” in type or lettering not smaller than 20-point type. (4) The serving of colored oleomargarine or margarine at a public eating place as a substitute for table butter is prohibited unless it is ordered by the customer. What flattened the margarine industry (or, more appropriately, the use of the word “margarine”) was the Great Trans Fat Scare of the ’90s. Trans fats, for those of you who skipped either the Food section of your local newspaper or chem class, are unsaturated fats (either mono- or poly-) that have been “partially hydrogenated,” or have had hydrogen added to them, in order to increase shelf life and decrease the need for refrigeration. They’re a cheap substitute for other fats and oils that suspend solids at room temperature, such as palm oil, lard, and butter. They have been linked to increased incidence of coronary heart disease, liver dysfunction, Alzheimer’s Disease, diabetes, cancer, and infertility, among other things. But they’re cheap, and market forces have brought them into our diet in great quantities. Since many margarines/buttery spreads/butter substitutes contained these chemical pariahs, they got swept up in the anti-trans-fat movement. To their credit, most butter substitutes — the former margarines — no longer contain trans fats (though some still do). But the damage was done. The margarine moniker had to go. These days, there’s a fair case to be made that butter substitutes are no worse for you, and possibly even better, than butter. After all, butter is richly laden with saturated fat, which is itself associated with coronary heart disease. And then there’s the whole animal exploitation/treatment issue, which is another topic for another time, but deserves consideration. Wise consumers will peruse the product’s contents (trans fats are now required to be identified separately from saturated and unsaturated fats), and choose accordingly, striking a balance between the palate and the peril. 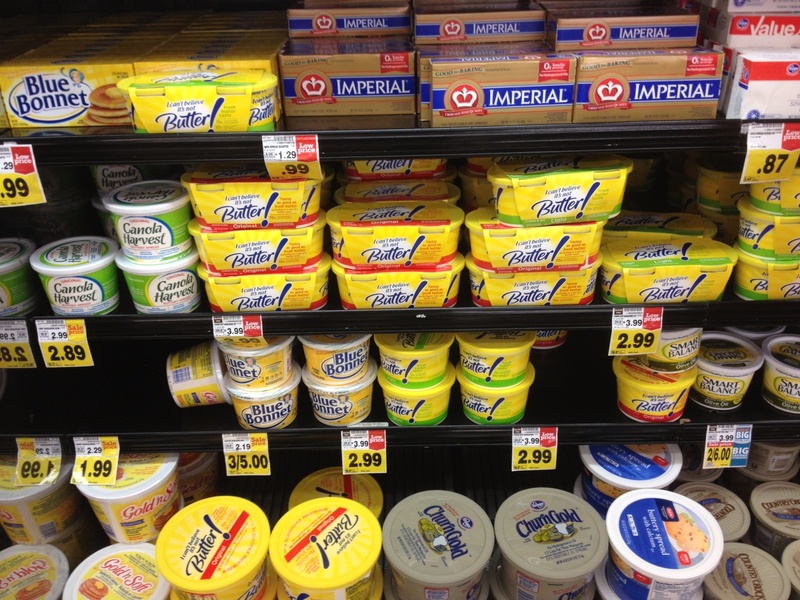 Coda: A persistent myth circulating around the Interwebs claims that “margarine is one molecule away from being plastic.” Two quick rejoinders: 1) It’s not true, and 2) So what if it were? Water (H2O) is one atom away from being toxic (hydrogen peroxide, H2O2). Salt (NaCl) is an atom away from being chlorine gas (Cl2). Get over it.